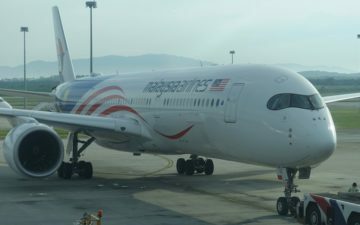 Malaysia Airlines operates a fleet of six new A350-900s. I find their A350 strategy fascinating, because each aircraft has a small first class cabin, using a modified Thomson Aero Vantage XL seat. This is similar to the new Delta One A350 Suites, as it has a closing door, and also the same seat design that airlines like Qantas and SAS use as their newest business class product (although those airlines do not have sliding doors in business class). As far as I know, Malaysia Airlines is the only airline to install a first class cabin in the A350. Airlines such as Lufthansa, Singapore Airlines and Cathay Pacific, all of which have excellent first class products on other aircraft, have decided not to install first class on the A350, so I’m interested to understand why a struggling carrier like Malaysia Airlines decided to do so. I’m as keen as you guys are for Ben to review this product as soon as possible, as it’s an odd choice to use a modified business class seat as a first class seat, in an aircraft other airlines determined didn’t need first class! 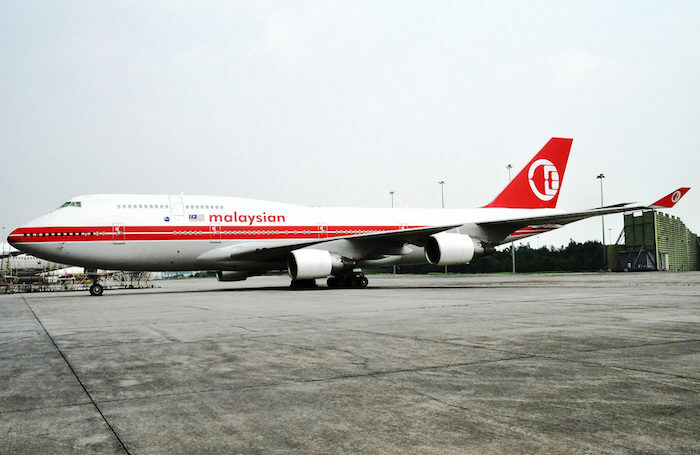 I’m sure there’s a strategic/financial reason for doing so that I am not aware of, although this is the airline that decided to restore a single Boeing 747, to cover maintenance of other aircraft, that never actually eventuated. 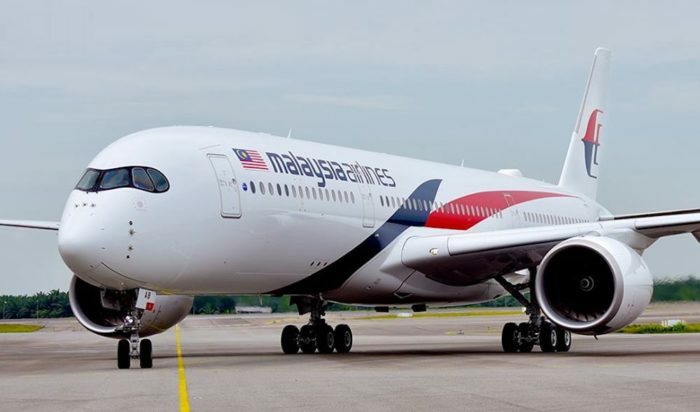 Malaysia Airlines has so far been using the Airbus A350 on its flagship route to London Heathrow, as well as to Tokyo Narita, and it will eventually replace their Airbus A380, which didn’t seem to ever really work for them. Now there’s good news and bad news about this aircraft change. While the aircraft change has been loaded into ExpertFlyer and the GDS, Malaysia Airlines does not appear to be selling first class on this route for this period. 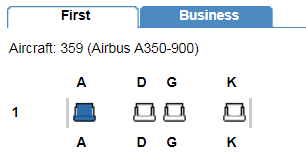 I’m not sure why they are putting the A350 onto this route if they are not planning to sell first class, given the total number of economy and business class seats is almost identical to the A330 it is replacing, and both aircraft have the latest business class product. If they didn’t plan to use this aircraft on a route to sell first class, why did they install a first class cabin? So, what will happen with those four first class seats Malaysia is not selling as first class? Well they appear to be available to select for business class passengers. Qantas does the same thing when it operates its A380 to Hong Kong — it doesn’t sell first class tickets, but does allow savvy business class passengers to select them, but receive business class service. Here is the ExpertFlyer seat map for the A350 service to Tokyo (which does sell proper first class). 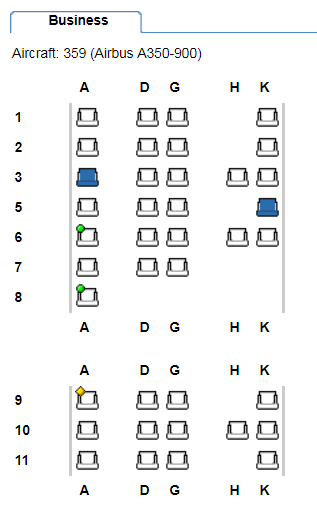 You can see row 1 is reserved for first class, while rows 2 on wards is business class. And here’s the seatmap for an A350 flight to Sydney. 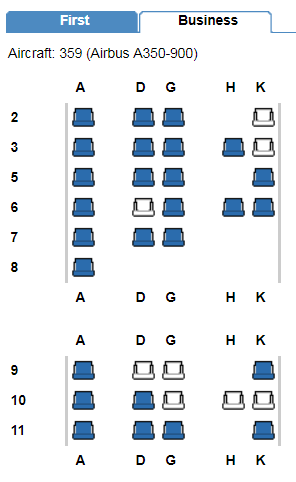 Notice that the four first class seats in row 1 are designated as business class. Now when some airlines (such as Qantas) do this, they often reserve these first class seats for their highest status frequent flyers, in this case oneworld Emeralds. As these seats are not ‘blocked’ on ExpertFlyer, it would appear that anyone with a business class ticket can reserve the seats in row 1. If you happen to be booked on MH122 or MH123 for this period, I would encourage you to try and reserve one of these seats regardless of your status. 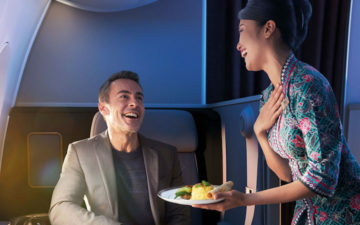 Although you will ‘only’ receive the business class soft product (meals, drinks, service, amenities), the hard product will be significantly better than the other business class seats on the flight. I would note that there’s a risk that they could change seat assignments for those who reserve first class seats, and later reassign those seats to others. If you are looking to redeem miles on this route, AAdvantage remains a smart choice, at 40,000 miles each way from South Pacific to Asia 2 in business class, remembering you can continue on to anywhere in South East Asia for no additional miles. 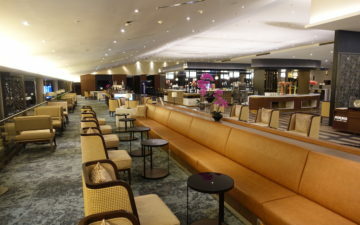 Even better value would be continuing onto Tokyo which would be only 60,000 miles each way in business class, from Sydney to Kuala Lumpur (remembering you may be able to score a first class seat), and then Kuala Lumpur to Tokyo in first class which has phenomenal award availability. On both of tomorrows flights, the ENTIRE first class cabin is available for awards. It’s nice to see Malaysia Airlines, a company that has had such a bad few years, purchasing new planes with new products. I’m confused as to why they are moving their newest plane with a first class cabin onto a route, but seemingly not actually selling first class on the route. They may wish to ‘show off’ the plane on a premium route but the A350 is hardly a stranger to Sydney. If you do have a business class ticket on these flights, I would encourage you to do everything you can to score a seat in row 1 for a very nice upgrade. Is anyone keen to try Malaysia Airlines’ A350? Well, I can guess at why they have first class – senior government officials. They expect to have an exclusive cabin, preferably to themselves, and expect to get upgraded there. After all, the airline is 100% government owned. Oh, this is also one of the few airlines to have biz class on the tiny ATR72. For pretty much the same reason. Don’t think it’s right to say that the A380 never worked out for them. I think it’s just that not one MH route can sustain the A380 capacity all year round. That’s why they have been rotating them between ICN, SYD and MEL during peak seasons, which is probably a much better way of aircraft utilization. MH’s reasoning for an F cabin on the A350 is due to London being a high yield market, and the A350 was initially purchased to replace the A380 for KUL-LHR. I’m guessing that their reason for not selling First Class tickets for SYD is to retain consistency of products in the Australian market (ex-PER). MH’s strategy is to deploy A330s for Australian routes. Maybe the A350 switch was for increased premium demand. The A350 represents a 12-seat increase for business class and a 16-seat decrease for economy class. Assuming they can fill both cabins (which they probably can due to their low rates and OneWorld involvement), we’re talking a substantial revenue increase here. 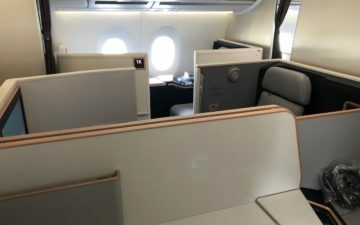 @ Alvin – isn’t the A350 only 8 more J seats than the A330? Given that MH offers consistently lower fares across all classes ex Australia, wouldn’t they want an F service SYD-KUL as the first sector of a trip to London? Thai is hanging on to F ex Sydney, presumably for the same reason, although that could change as the 747 is retired. Qantas screws customers on Malaysia by refusing any meaningful mileage accrual in QFF, but even with that ,Malaysia is so much cheaper that it’s worth foregoing the points. I hope they bounce back; it’s a better than average J product , representing good value. I think you are a bit lack of aviation knowledge. MH is not the only carrier that featuring first class for A350, and also MH is not originally intended to have A350 in Australian route. The A350 was initially purchased to replace the A380 for KUL-LHR where there is demand in F cabin on the A350. @ Alex – keen to hear what other A350 operators have F on their A350s. On top of a Malaysia review, I would like to see a comparison of DL J and MH F! @Garrett: Thought the same thing – she sure is fawning over him. Think you’ll get first row seat by paying business? Think really hard. During A350 trial run between KUL-BKK, Malaysia airline unceremoniously cleared and reassigned everyone who had selected first row seat. When I called them, they say it’s an error and management’s decision to leave it empty! Maybe it’s just for consistency. Just like LX flies a 330/340 to TLV without selling the F cabin. It would be make sense to configure one plane without first class. Or maybe they will sell it at some point. @Garret, awesome! You are right. What a ridiculous publicity picture. Other airlines do not have F on their A350s because for the most part its not their flagship aircraft. As someone else mentioned it also caters to the Gov Elite of Malaysia (this is not a secret). MH (KE – 787 I believe) and any other carriers that adopt this layout are actually quite smart, since its a separate cabin they can offer a F Class level of service, and when operating a J and Y route those seats can still be allocated as J to full fare J and FF Elite pax etc. Malaysia is a very rich country, the rich (along with ALL airline bloggers) expect F class upgrades! Also if a F class pax is flying SYD-KUL-LHR, they will be seated in the F zoned seat ex SYD. MH management is messy, but there has been some thought put into this. 350 is not common in syd. afaik only china airline is operating it. “the A350 is no stranger to Sydney” Only CI flies A350s there. @William is correct. Even if we selected row 1 seat at reservation, MH will change our seats to “below row 2” seats without notice by the departure. MH usually uses first class seats as clew rest or dead head pilot’s seat. A350 is unfortunately quite a stranger to Sydney. Is it just me or they have absolutely nil award space a month or two out on KUL-SYD? Im looking at both BA and QF websites. @ James — Yes, but you forgot to count the four first class seats as well, which are also marked as business class. James, at least MH has bothered to differentiate the F seat from J. Compare and contrast that with KE where they have identical F and J seats (Apex Suites) on some of their aircraft. Now THAT I don’t get, even if the soft product is differentiated. James, the F class seat on the MH A350 is NOT the same seat as the Delta (or SAS and Qantas). 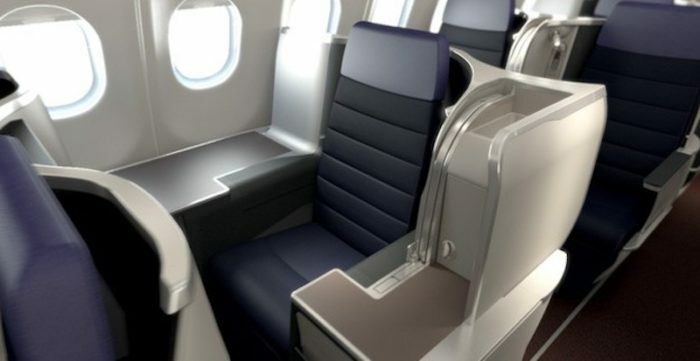 Those seats are Vantage XL or XL+, with Delta adding the door. There are no footwells with the seat MH has; there’s also much more space. Expertflyer isn’t always perfect about showing blocked seats as being blocked in its seating maps. James, thanks so much for this. We’re flying Syd HKT in october and just moved from row 2 to row 1, timing was perfect. There was no issue changing to row 1 although I am OWE. Hmmm booked z fare to tokyo which is cheaper than qantas economy. No issue selecting first row for the outbound mid-sep which shows a350 equipment, however the inbound leg early Oct still shows a330… oh and qf website still shows absolutely ZERO availability in J. Not that it matters the redemption value would have been like 1.5cents anyway. I would be very wary on selecting first row, at check in or at the gate you will most likely get bumped to a whatever J seat is left which at that point will most likely be the worst J seats in the cabin.